In 1964, my family was part of an effort to reduce segregation in the New York City Public Schools. Today, the New York Times reflects on the history of NYC school segregation in, “Segregation Has Been the Story of New York City’s Schools for 50 Years”. 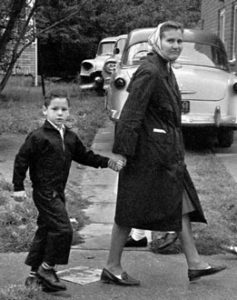 In the photo, a mother walks her son toward P.S. 92 in Corona, Queens. That mother and son is my mother Eve Winer and me. In 1964, the photo was published on the front page of the New York Times. It was also republished by Newsweek and other magazines. I remember the day and I specifically remember the photographer between two parked cars, capturing the image. Any time we ever mentioned the photo – including very recently – my mother would always complain, regretting that she hadn’t done her hair or worn makeup that day.